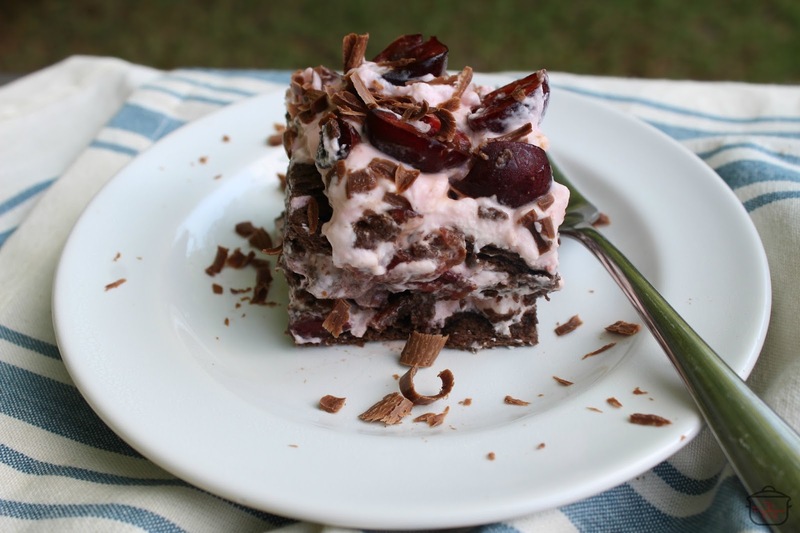 Today we are having a picnic, and I brought these Chocolate Cherry No Bake Bars! These bars are easy to make. They do take a little bit of time; but they are so worth it! 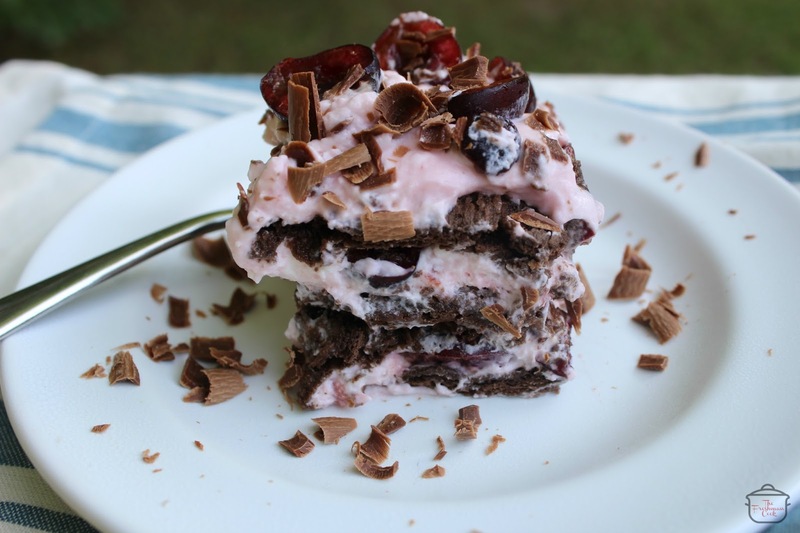 Creamy, tasty, and full of chocolate and cherry flavor. They are a perfect dessert! 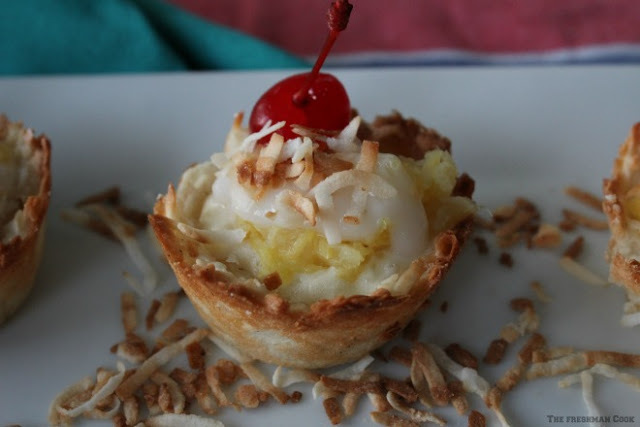 They fit in at a picnic, a campout, a backyard party or anywhere you want to serve a fun dessert that everyone will love! Plan time to make this dessert. It has to be refrigerated for at least 3 hours after making it. 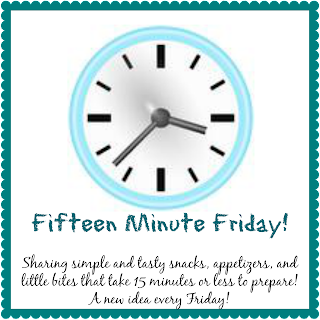 It can be refrigerated for several days if you wish to make it ahead of time! 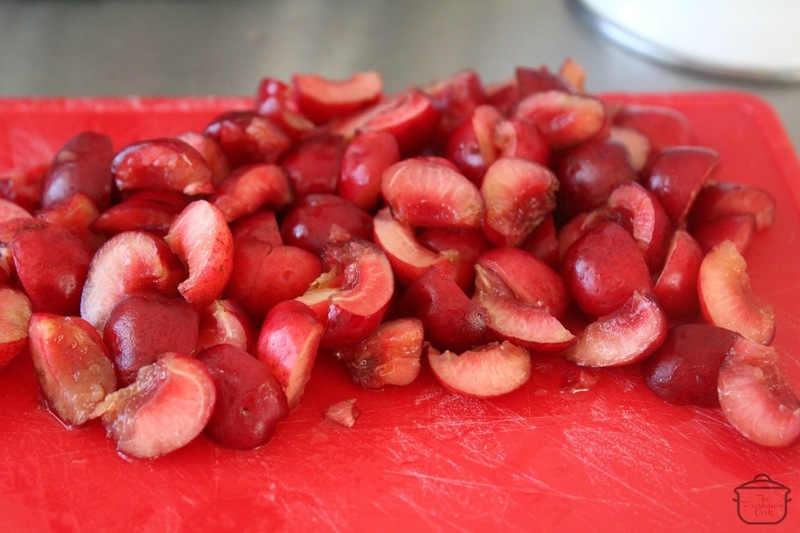 Wash the cherries, take the stems off, pit the cherries, and cut them in half. Place in refrigerator until needed. 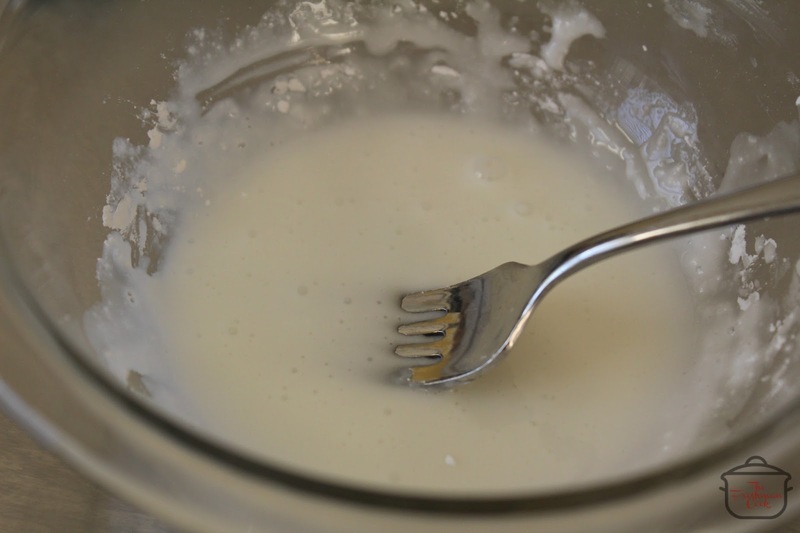 Make whipped cream with the whipping cream, adding sugar as desired. I used fresh whipped cream, but pre made whipped cream will work also. Mix the whipped cream with the containers of cherry yogurt; just mixing with a spoon. 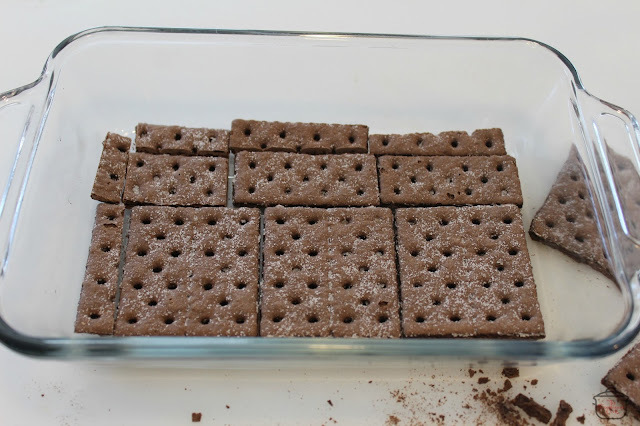 Fit chocolate graham crackers onto the bottom of the pan, You can use any size pan for this recipe. I used a small one that is 6"x9". If you prefer to use a larger dish, adjust the amount of the ingredients to fit your pan. The graham crackers are easily cut with a serrated knife by "sawing" back and forth. You will be making 3 layers, so divide your yogurt whipped cream mix accordingly. 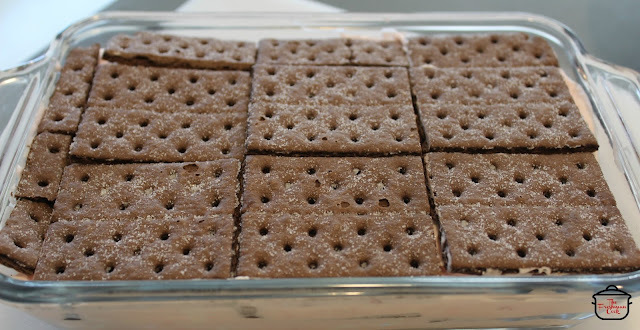 Place the first layer over the bottom layer of graham crackers. Add cherries, again keeping in mind that you will have three layers of cherries. Add the second layer of graham crackers right on top of the cherries. 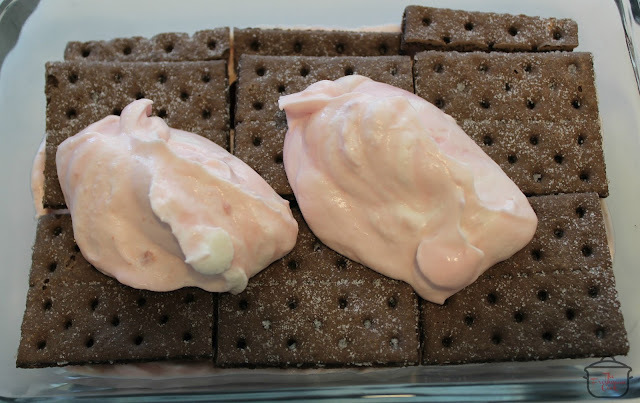 Then spread a layer of the whipped cream yogurt mix on top. Add more cherries. Add the final layer of the graham crackers when you are almost to the top of your pan. 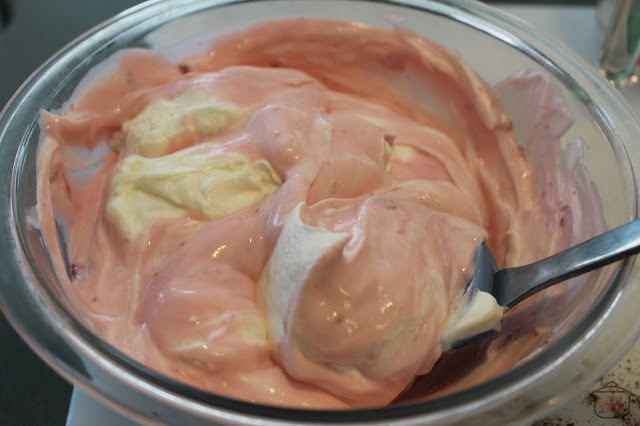 Add another layer of whipped cream and yogurt mix, and top with the cherry halves. Use a vegetable peeler to shave pieces of chocolate from the block of chocolate to the top layer. Cover with plastic wrap and refrigerate for approximately 3 hours. Check to see if the graham crackers have softened by sticking a toothpick in to several spots. The toothpick should go down through the crackers. Once it does, the bars are ready to be cut and served. The bars should be kept refrigerated. The longer they are refrigerated, the better they taste and the softer the texture. Serve right from the fridge! Thank you to our host today, Christie, who blogs at A Kitchen Hoor's Adventures! Keep scrolling down to find more picnic recipes from the rest of the #SundaySupper cooks. I know you will find even more to love! 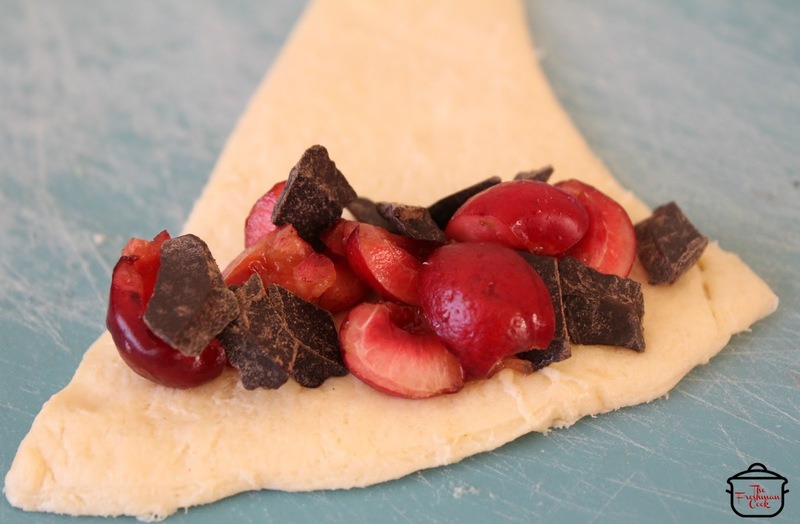 It is 15 Minute Friday, and today we have some Chocolate Cherry Crescents to share. 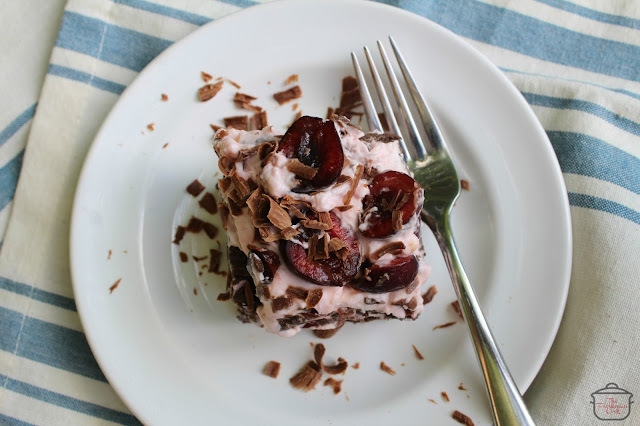 Made with fresh cherries and semi sweet chocolate, these are sure to become a favorite treat! Pit cherries and then chop the cherries in to quarters. Unwrap the crescents and cut apart from each other. 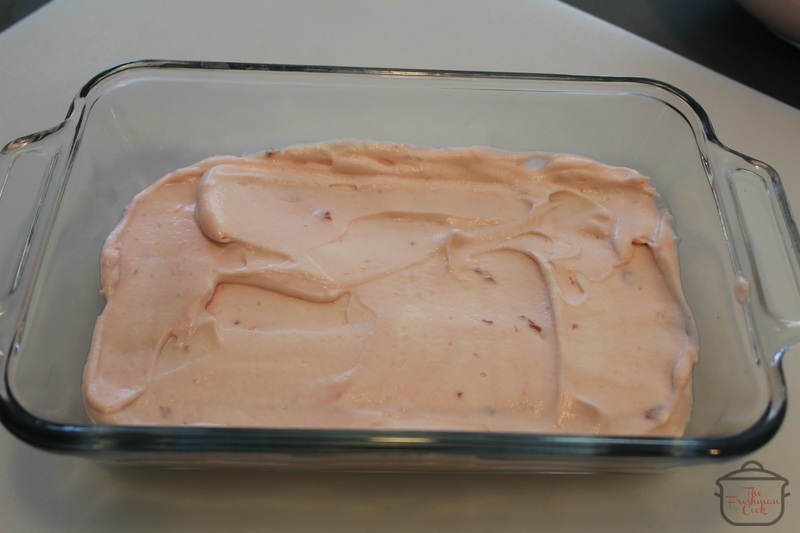 Add 1 tablespoon cherries across the bottom section of the crescent. Add a small amount of chocolate, like above, depending on your preference for chocolate. Turn in both sides, and roll the crescent. All sides should be closed so nothing can leak out. 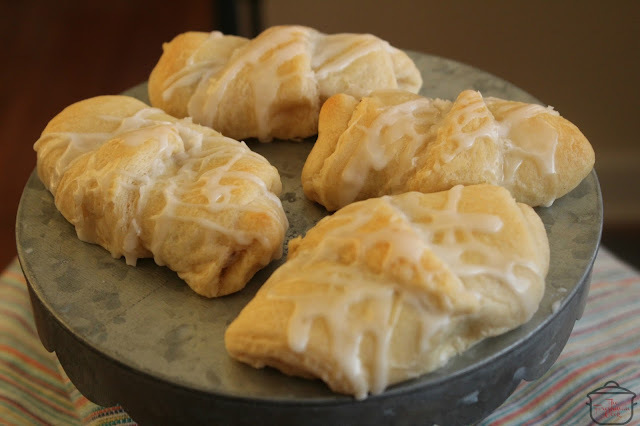 Place crescents on baking sheet, bake according to package directions. 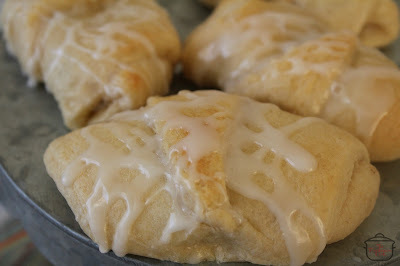 While crescents are baking, make glaze by adding milk to confectioners sugar. You can also use water instead of the milk. Mix together until glaze is smooth. 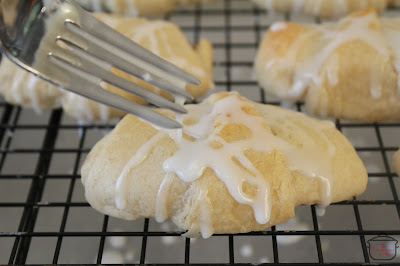 Remove crescents from oven, let them cool. Drizzle with glaze. I tried to keep this to 15 minutes, but it may go over a little. You could use canned cherries and it would be quicker. Thank you for dropping by today! Enjoy! While crescents are baking, make glaze by adding milk to confectioners sugar. You can also use water instead of the milk. Mix together until glaze is smooth. Remove crescents from oven, let them cool. Drizzle with glaze. Let glaze set up. Enjoy! Today at #BundtBakers we are showing off our fruit and nut inspired bundt cakes! For me, my cake had to be a Cherry and Sliced Almond Mini Bundt Cake! Cherries are my summertime obsession this year! I am loving them!! 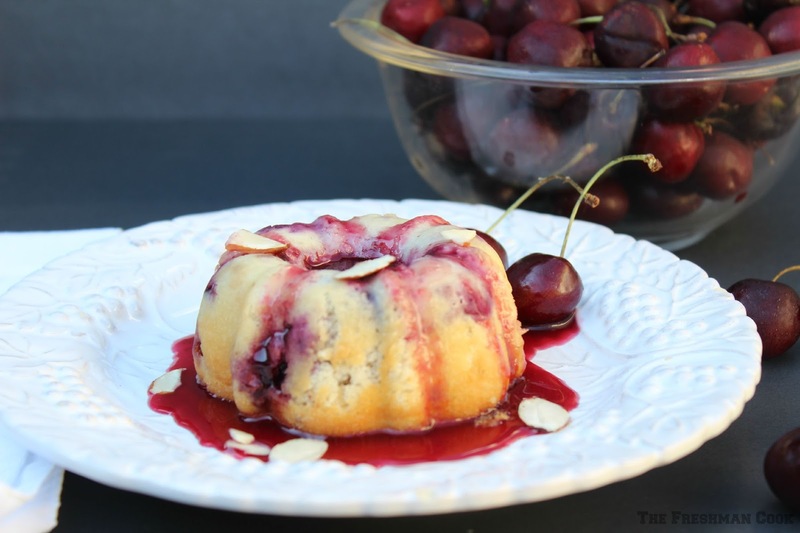 I also added a fun, tasty cherry sauce that is so easy to make, it's ridiculous! 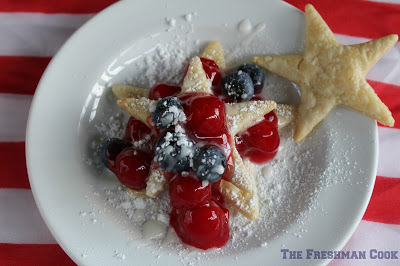 You will want to make this! Every couple months I try to send a little care package to my former neighbor in Utah. He loves getting small loaves of bread that he can eat a little bit at a time, so I included this Chocolate Cherry Banana Bread! He is the best neighbor we have ever had, and the sweetest man I have ever met, and my family misses him dearly. He is making plans to visit us here in North Carolina, and we are eagerly anticipating his visit. In the meantime I want to make sure he has his full allotment of treats, and I think this Chocolate Cherry Banana Bread will satisfy that craving! 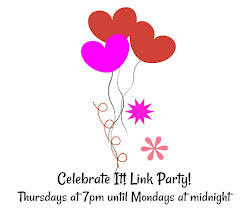 Black Forest Mini Cupcakes and a Giveaway! It's Tuesday of our "Mini Week" and today we having Black Forest Mini Cupcakes for dessert! It's also Day 2 of our giveaway. You can sign up everyday until the drawing on Sunday! There is a picture of the giveaway at the end of this post! Check it out and enter everyday! 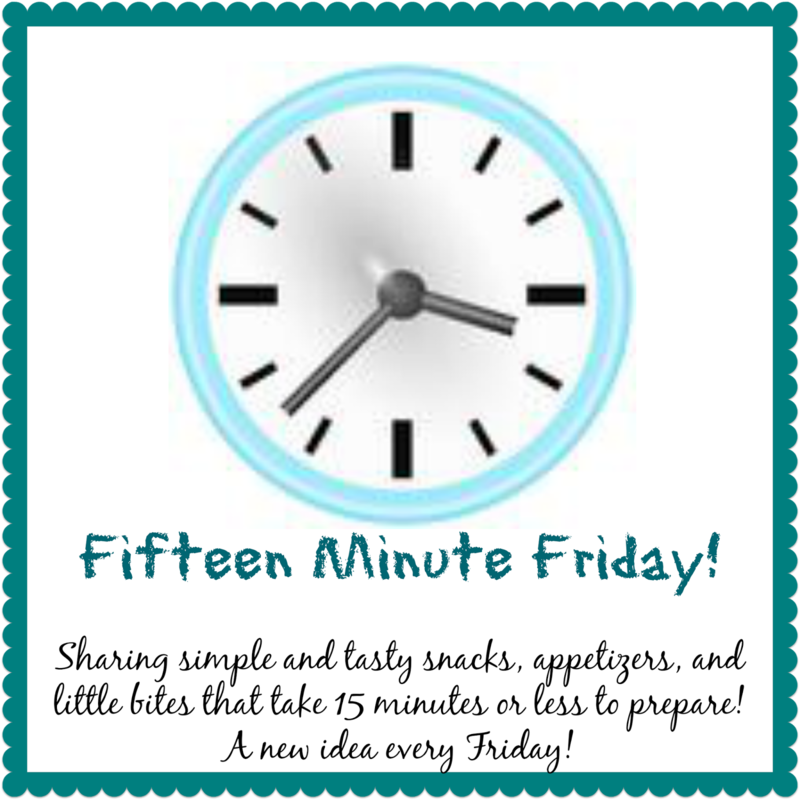 Leave me a comment telling me what your favorite mini dessert is, and for 2 extra entries, like us on facebook, and follow The Freshman Cook. Leave me a comment about that too. Enter every day this week until Sunday! for the garnish on top. buttermilk, oil, eggs, and vanilla in mixing bowl. Mix for 1 minute on low. Scrape the bowl, and mix again on medium for 2 minutes. I used 2 ounce souffle cups for cupcake wrappers. Put a small spoonful of batter in the bottom of the cup. Place 2 pitted cherries on top of the batter. 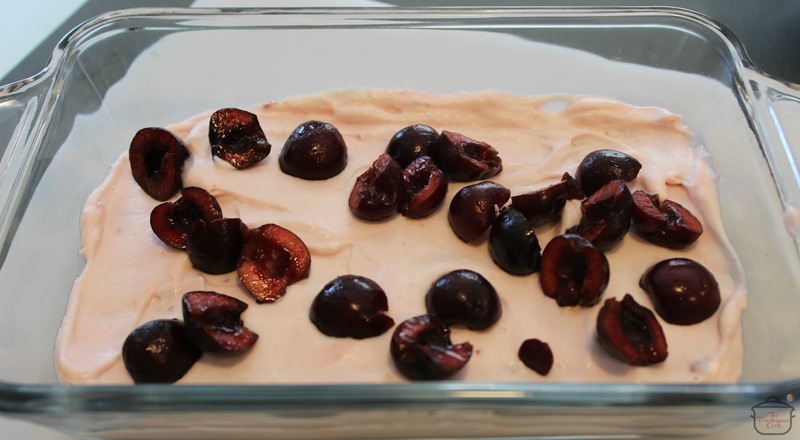 Cover the cherries with more batter. While your cupcakes are cooling, make your frosting. 2/3 cup of unsweetened cocoa in bowl. Add confectioners' sugar, milk, vanilla and salt. more milk. If it is too thin, add confectioners' sugar. in as good a shape as possible. Top cupcake with cherry. This is our mini giveaway I mentioned above. ends Sunday at 11:59 pm PST. 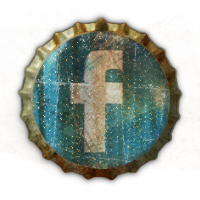 by liking us on facebook, and following The Freshman Cook. you will have 9 entries! It's time again for the Crazy Cooking Challenge! This is such a fun challenge. Each month we are assigned a featured food. This month it is chocolate cake! Yum! Our job is to go out into blog land and find a chocolate cake made on a fellow bloggers blog. Then make the cake, and post it on your blog. There are some rules, of course, so once you join, you'll have to read the fine print. But you are going to join, right? 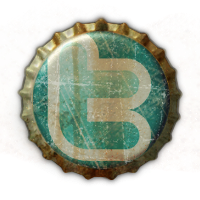 It easy, fun, tasty, and really interesting! You will love it!! You should join! Put all the ingredients in a mixing bowl and mix well. Let cook until done, about 20-30 minutes. and the butter together. Add the vanilla. Make sure it incorporates and mix well. Cut the two layers in half, widthwise. frosting, place a layer of cherry filling. Put the top on the cake. Do the same thing to the top layer. Add top layer to cake before frosting. thought this cake was begging to be decorated with a heart! I changed a couple things from the original recipe. Nikki used chocolate chips in her cake. I omitted them. 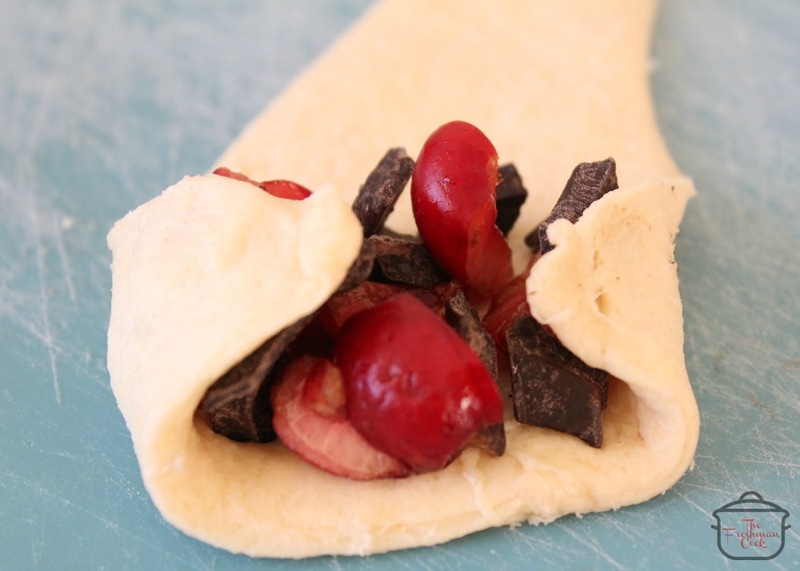 icing and add cherries to the layers. Because I can't say no to him, I honored his request. the moistest, unbelievably best chocolate cake he has ever had!! He is right! You will love this!